Momma Told Me: Try counting sheep. When it comes to my health I am aware that I struggle with two major areas; hydration and sleep. For many years, in my early twenties, I would maintain such a harsh and dramatic sleeping schedule that I would often be caught 'sleeping' from 1PM to 6PM, and found wide awake throughout the night, electively. And, by 'elective' I mean that I had no job requiring me to do such, but a complete disregard for my internal clock or healthy slumber functions. Because this went on for years I trained my body and mind to be restless, and generally lazy. Over the past few years it has been an immense struggle for me to get my sleeping habits back on track. When we are children we take a full night's sleep for granted, in fact, we even go through great lengths to avoid it, and postpone it, as much as possible. As adults, with the demanding requirements of family, work, and just plain living, we tend to see the irony in this. Sleep becomes a precious commodity we would soon trade any number of chocolate sundaes for. I have wrestled with treatment for my inability to fall asleep, and stay asleep, and strictly avoided prescription medications. Because I am such a light sleep, and struggle with getting to sleep, I have to minimize the time spent trying to fall asleep, and preserve my sleep time, as much as possible. Once Jay is up for work at 6AM, so am I, whether I like it or not, so falling asleep fast, and early, is a crucial key to my healthy sleep. Recently this has meant a regular regimen of melatonin supplements at night, and adaptive sound technology. Adaptive Sound Technology sounds much more technically 'scary' and expensive than it really is. 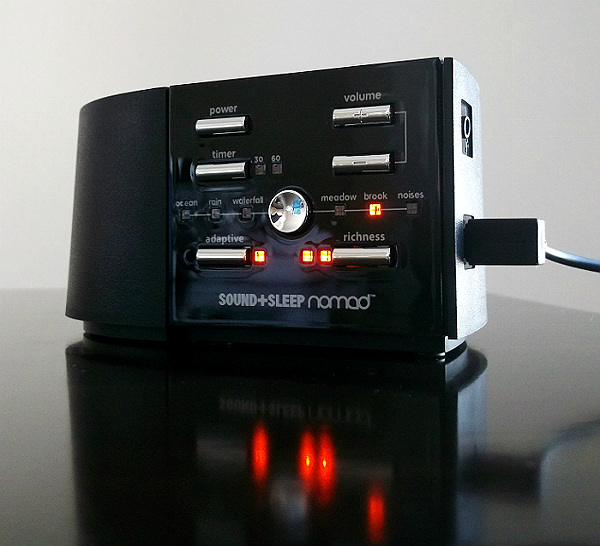 A Sleep Therapy Machine, such as the Nomad, can run as little as $150, and is as simple to operate as adjusting and setting an alarm clock. 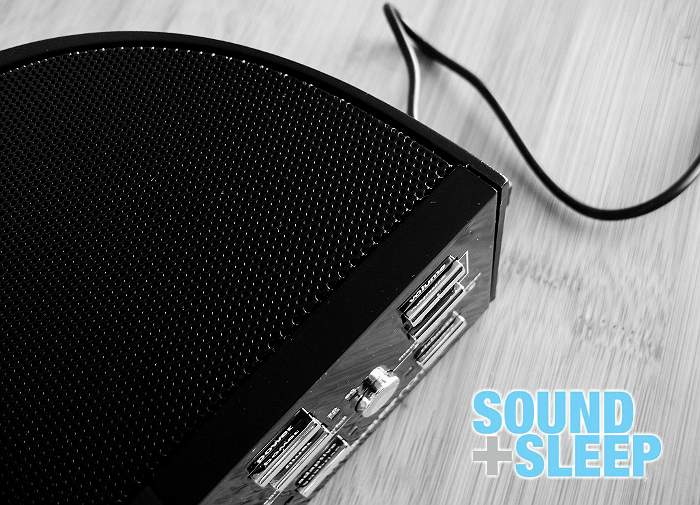 Utilizing natural and background (white) noise machines to help drown out suburban noise pollution, or the sheer silence of the night, can easily calm your mind and lure you quickly to sleep. I've recently begun using the Nomad travel system which is light enough, and small enough in profile to be stashed in a purse or common toiletry bag. 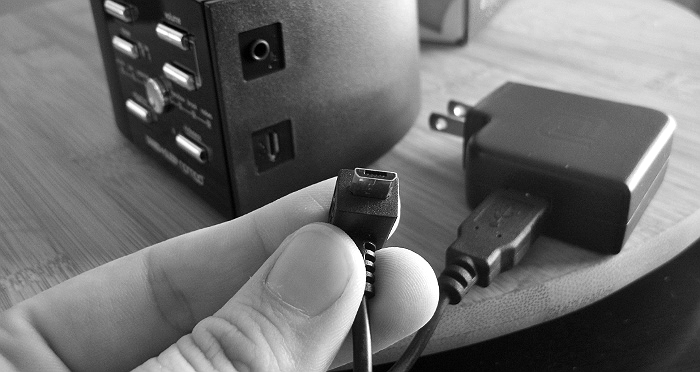 It only requires the simple, included, AC adapter for set up and immediate use. 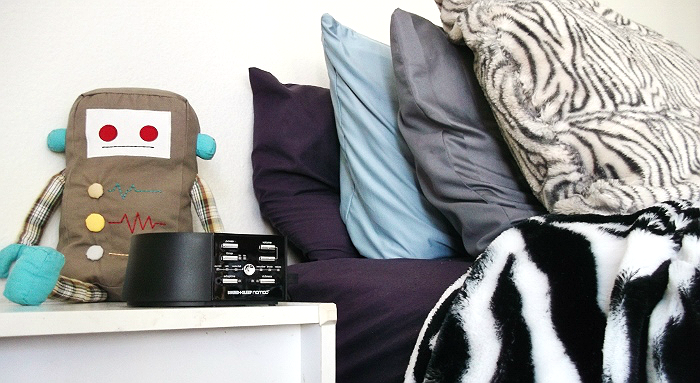 As you might have reasoned, this Sound + Sleep machine generates several natural noise sequences to help drown out background noise and also create soothing alternative noise. While the Nomad does include basic waterfall, waves, and rain, profiles, it also has a few unique profiles and settings that make it especially appealing. With White, Pink, and Brown noise profiles, users can create a natural ambient noise that is barely audible by detection, but naturally soothing. If you've ever been lulled to sleep by the soft vibrations of a moving car, or the gentle sound of your laptop fan (all the time, here), then you know how important these ambient tones can be to a calm rest. In fact, there's even a sound profile for 'Electric Fan,' which is my personal favorite. Perhaps most unique, in regards to this sound machine, is the adaptive sound technology which actually listens to your surroundings and alters the pattern intensity and sound level to mask obtrusive sounds in the vicinity. 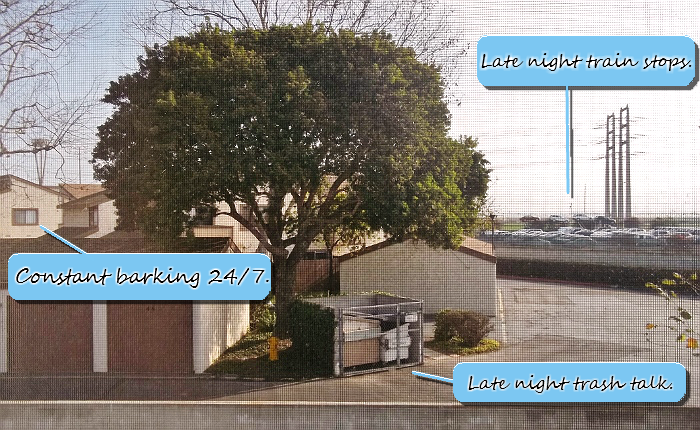 Just outside our master bedroom window is a station where commercial transport stops regularly to deposit extensive automobile loads, and an adjacent complex where a dog can be heard barking incessantly at all hours of the night. The adaptive sound feature had proven itself priceless with these sound intrusions. Because I can set the Nomad for a 30, 60, or 90 minute cycle, I don't have to worry about waking up to the noise, or having the unit running all night. Operation and settings are beautifully illuminated in the night with red LED indicators that fade shortly after setting selection. 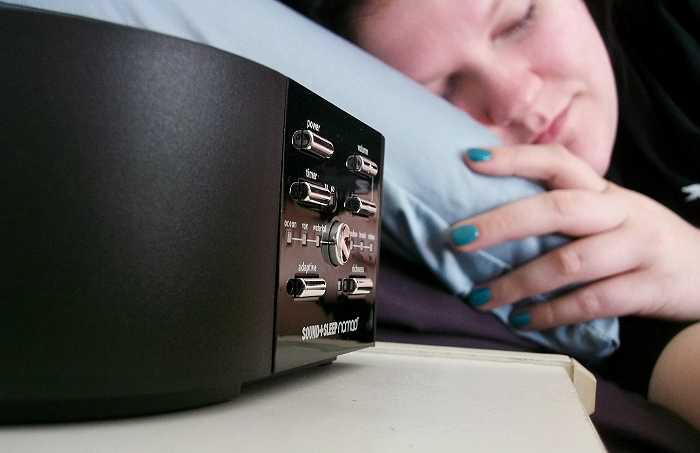 We can even feed audio through the input jack and play our own music and sounds with the adaptive technology, making this an ever evolving investment in our sleep and sanity. Gone are the nights of running a fan in the middle of winter to drown out the suburban noise; I am thrilled with the results of our Adaptive Sleep Technology Nomad! What Daughter Says: I might be a little 'new school' on this, but adaptive sound therapy is much more soothing than wondering when that sheep's going to miss his hurdle. 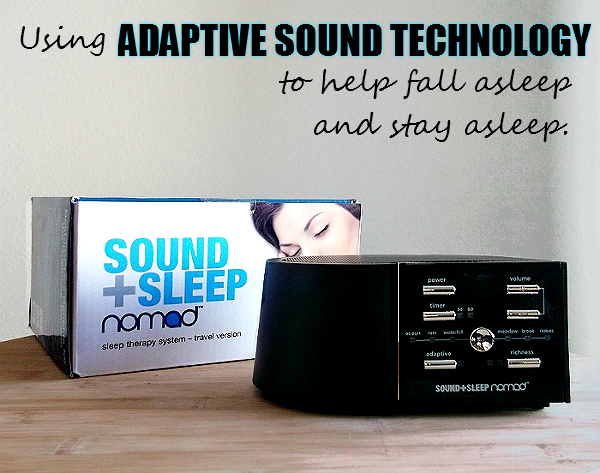 Enter below to win a Nomad Adaptive Sound and Sleep System, valued at $149! I love that it can use AC, battery or USB for power. I really like the nomad because it's so portable. We could put batteries in it and take it on vacation with us. That's always an issue--getting the kids to fall asleep when we're away from home! I really need this to fall asleep! I have the hardest time! I love the portability. We travel quite often and the children aren't keen on sleeping in places with "strange" noises, this way we could bring our "home" noises with us. I like to the NOMAD because it seems more portable. I like the select of High-Definition Sound Profiles. I love white noise while I sleep. This looks like a great option. The selection of timers and sounds. I like the Soundstories options! I like that the lights can be turned off. I like that it has a timer with different minute options. The feature that really appeals to me is the number of unique sounds. I've never seen a sound therapy machine like this one before. I love that it has fan noise! My husband hates the breeze from the fan but I cannot sleep without that sound. This would be a great compromise for us! I think I like it being easy to take with you wherever you go and the different ways you can charge it up. I like the Sleep Timer feature. I love that it will play all night and has a "Fan" sound option. I sleep with a fan every night so this would be awesome as an alternative! I like that it can run on batteries. I really enjoy how many different sounds you can play I didn't even know what they all are, like pink and brown noise? I have only heard about white noise! lol! I like that it's very lightweight. I love that it can play all night long, as soon as the TV/radio shuts off it wakes me up. I like that you can turn off the display lights!! This is pretty awesome!! Right now I use an app on my cell and I fall asleep to alpha and beta waves mixed with rain and wind sounds. I like that it has a HEADPHONE JACK. I love that it has a sleep timer. I currently set the sleep timer on our TV for my back ground noise. I like that with the nomad, you can play music too! I like that it has 60 unique sounds. I love that it can play all night! I love the vast variety of sound choices! I like the feature that there are a variety of sounds and that you can use a timer. I like that it is lightweight so we can use it in our camper. And I like that it has a timer, or it can run all night! I really like that there are so many sound choices! I think the rain or ocean would be my favorite, but I'd totally have to experiment with all of them! I like that there is a variety of different sound options. I like that there is such a large variety of sound options. The feature I like the most are all the sounds available.